The “Happiest Place on Earth” is definitely an all-encompassing food mecca (I love my Mickey Mouse-shaped ice cream and turkey legs). But venture outside the Magic Kingdom and you’ll find buzz-worthy eats in Orange County food halls like the Anaheim Packing District — home to 20-plus food vendors — and Santa Ana’s smaller but equally delicious 4th Street Market. So move over, turkey legs. Check out some of these crazy, savory eats the next time you’re in the OC. Spaghetti grilled cheese: a mash-up of two American classics. If Burnt Crumbs vaguely reminds you of the Burntzilla truck, you guessed right — they’re owned by the same guy. While Burntzilla is known for their crazy hot dogs and sliders, Burnt Crumbs is serving up outrageous sandwiches. 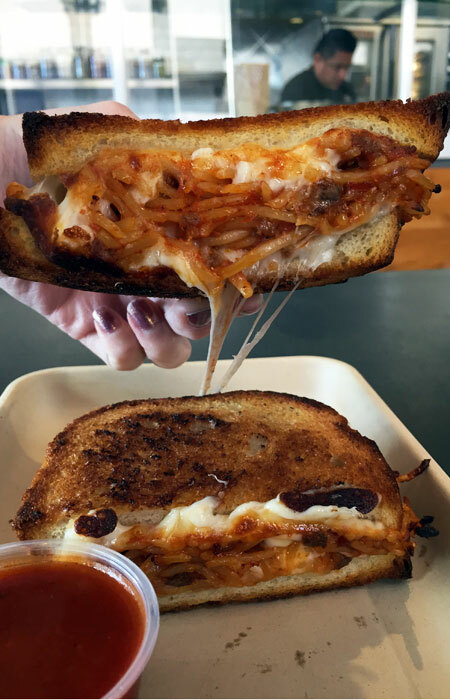 Burnt Crumbs opened in Irvine last October, and two of its menu items have quickly become customer favorites — the Fried chicken biscuit sandwich ($9) and this absolutely cheesy Spaghetti grilled cheese. I love the stringy gooeyness when I slowly pull the sandwich apart. The crunchy grilled bread blends harmoniously with the chewier noodles. And while I love the cheesiness, it’s the house-made bread that’s most memorable, thanks to that crunch and a slight chewiness. 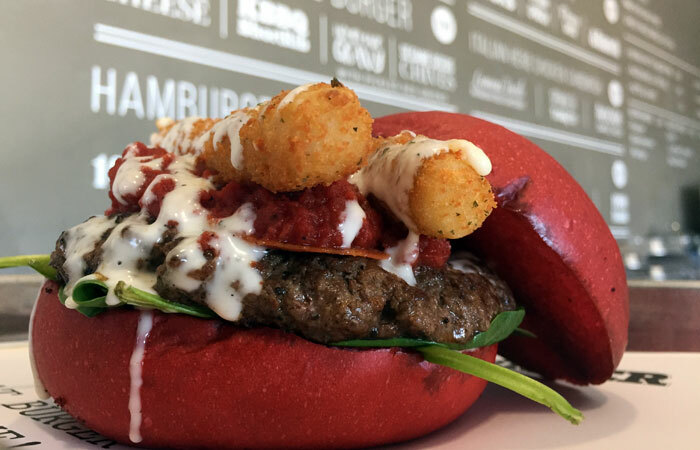 The Italian Stallion burger has two mozzarella sticks, pepperoni, spinach, pizza sauce and ranch dressing between spongy, raspberry-infused buns. With options like the Juan & Only (the spiciest menu item) or KBBQ Poutine (OMG succulent short ribs atop a burger? ), this burger shop makes ordering hard. Really hard. When in doubt, always go with the Italian Stallion. It’s a tried-and-true customer favorite because of one key ingredient: mozzarella sticks. The Stallion is hard to bite into without making a mess, but it’s worth it to experience all the components at once. The piping hot mozzarella sticks ooze cheese, the pepperoni reminds me of my favorite pizza and the ranch dressing caps everything off. Go with the raspberry buns over the plain — the sweet aftertaste balances the ultra-savory burger. Lobster breakfast burritos with eggs, bacon, cheese, veggies and a generous portion of lobster. The lobster roll ($14) is a Slapfish staple — a warm butter roll filled generously with lobster, crab and shrimp. But the lobster breakfast burrito is worth the extra dollar. Slapfish had just rolled this baby out weeks before my visit … and trust me, these burritos were selling like nobody’s business. SoCal is already burrito heaven, but when you throw lobster in there, breakfast takes on a new meaning. 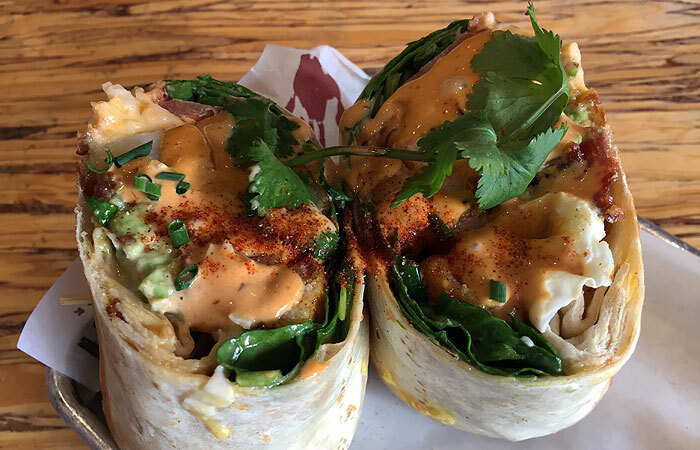 You can order these lobster burritos at any time of the day, at any Slapfish location, except the one at LAX. There’s plenty of lobster chunks throughout the entire gargantuan burrito. There’s also hearty potato chunks, bacon bits and gooey cheese, with eggs located toward the base. Oh, and Slapfish’s signature Awesome Sauce (it’s creamy with a bit of a kick) is drizzled all over. 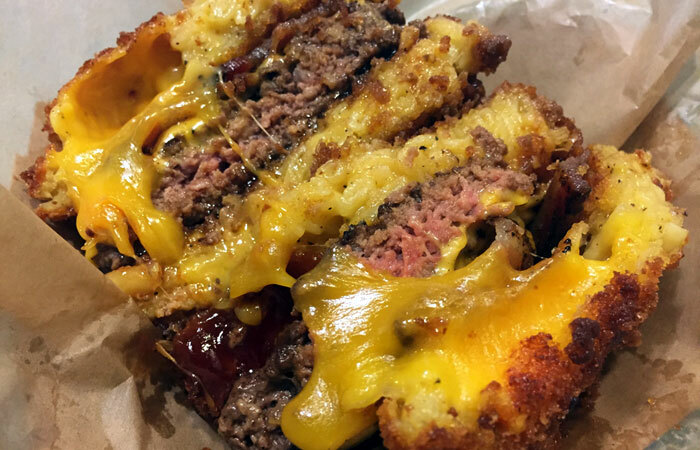 I like big buns … especially when they’re made of deep-fried mac and cheese. I like mac and cheese and I like burgers. Combine the two, throw them in the fryer and a food coma-inducing feast results. The Cheesy mac bun burger is the top seller at Pig Pen Delicacy. It’s Instagram-friendly once you cut into those deep-fried buns, but if you’re like me, the oozing cheese might be too distracting to photograph much before you have to bite in. The buns are chock-full of creamy mac and cheese encased in a perfectly crispy shell. The beef patty is succulent and juicy, but it’s not the highlight. For me, it’s those oily, greasy mac and cheese buns that are the game-changers. Oh, and the entire thing is coated in BBQ sauce for a one-two punch of slightly tangy and smoky flavors. Add pulled pork or extra bacon to make it extra meaty. After all, calories don’t count if you’re on vacay.